MAY – Plant More Exciting Heat Lovers! We have had crazy April weather in Santa Barbara! Night temps were low for the longest, then we have had HOT days followed by more cool evenings and now we are back to hot. My kale and cabbages bolted. Early varieties of tomatoes have done well and corn and hot pepper plants, but few have risked planting bell peppers yet. They like warm evenings and soil. Recent night air temps have still been in the late 40s, up to as much as 58. Soil temps in the sun are now 60 to 68. Peppers especially need warmer temps, nighttime temps above 55°F, some say 60, and soil temps above 65°F. If planted too soon, sometimes they miss their natural sequence of production, and never produce. Best Planting Temps Per Veggie! May is generally the super month for more heat lovers, but many here haven’t planted their first rounds yet. If your area has been behaving, space permitting, do plant your second rounds this month! Start some more, different varieties of tomatoes, peppers, eggplant! The special planting treat of May is CANTALOUPES! Start from seeds, transplants or both! Add different varieties with different maturity dates for a steady supply, a palate pleasing assortment! Some people just remember when they planted what. Others make an ID plant tag with the plant date and name on it and the # of days to maturity. A quick glance will tell you if that set of plants is ready for another round to be planted. Or, just jot it in your calendar so you be sure to plant another round in 6 to 8 weeks. If seeds and tending seedlings aren’t for you, transplants are fine! Eggplant, limas, all melons, all peppers, pumpkins and squash! Many wait until even June to plant tomatoes to avoid fungal problems, but if your garden is fungus free, plant away! Ideally you would wait until the soil has warmed to 70°F before sowing squash and melon seeds, but if you can’t wait, and who can?, get nursery transplants and pop them in the ground! Some gardeners do wait until JUNE to plant southern heat lover okra. Choose faster maturing varieties for coastal SoCal. If YOU anticipate a HOT summer, plant a tad earlier, but be prepared to deal with it if summer is overcast as often is the case after all. Right now, in addition to the plants listed above, sow and/or transplant more asparagus, beets, carrots, celery, chard, corn, herbs, kale, kohlrabi, leeks, heat-tolerant leaf lettuce, parsley, peanuts, white potatoes repel squash bugs, radishes (with cukes to repel cuke beetles, and with eggplant, potatoes and arugula to repel flea beetles), and spinach. See last month’s chat on Tomato and Cucumber specifics, especially if your soil has Fusarium and Verticillium wilts as ours does at Pilgrim Terrace and Rancheria Community Gardens. Mainly, keep those babies’ leaves off the ground! Remove lower leaves, get them UP in a cage or trellis and lay down a loose 1″ deep straw mulch blanket. Too much straw keeps the soil moist, which is good for some plants, not for others. Under maters and cukes, we want some air circulation and a bit of soil drying. The main purpose of mulch is to keep your plant’s leaves from being water splashed or in contact with soil, which is the main way they get fungi/blight diseases. Tomatoes! Heirlooms are particularly susceptible to the wilts, Fusarium and Verticillium. Instead, get varieties that have VFN or VF on the tag at the nursery. The V is for Verticillium, the F Fusarium wilt, N nematodes. Ace, Early Girl, Champion, Celebrity, are some that are wilt resistant/tolerant. In Santa Barbara area continued drought conditions, consider getting only indeterminates that produce all season long rather than getting determinates that need start up time every time you replant, that need water during no production periods. If you are canning, then by all means, get determinates. In the Mother Earth News tomato survey, they found gardeners chose heirlooms over hybrids if their soil is wilt/blight free. Otherwise, the longer the gardener has gardened, they more they chose wilt resistant toms if their soil has fungi. La Sumida has the largest tomato selection in the Santa Barbara area! See Special Planting and growing tips for your Tomatoes and Cucumbers! With our warming temp trends, get bolt resistant/slow bolt varieties, and especially heat and drought tolerant varieties. Heat tolerant tomatoes and beans (Rattlesnake) keep right on producing when temps get up to and above 85. Check out this nifty page of heat tolerant varieties at Bonnie Plant! If your plant is not heat tolerant, wait. When things cool down, it will start making flowers and setting fruit again. Companion planting is more than saying Howdy! Certain combos enhance growth, others repel pests, some invite beneficial insects! Strengthen your garden! Plan your Companions! Keep the biodiversity rolling! Plant pest deterring plants first so they will be up and working when you put in your or seeds or transplants! Put in ‘licious fast growers like lettuce, beets, turnips, arugula, in space being held for subsequent plantings. To use your space super productively, put these veggies on the sunny sides under any large plants. If needed, remove lower leaves that would shade out the ‘littles.’ If you anticipate unusually hot summer weather, grow the littles on the east side of larger plants to protect them from the afternoon sun. In these drought times, water before 10:30 AM if at all possible. The earlier the better. Make your basins large enough to accommodate your plants water needs out to the dripline. Water at the base of your plant. If your plants are dusty, you are near a road or there has been a wind, give them a bath. Dusty plants are habitat for White Flies. Keep a lookout, and hose away ants. The general rule of thumb is 1 inch per week. In very hot or windy weather, water as needed, even as much as twice a day! Water beans, cukes, lettuces and short rooted varieties of strawberries more frequently – 2 to 3 times a week, daily in very hot or windy weather. They are all workhorses producing fast and repeatedly, cukes making a watery fruit even. Lettuces need to put on growth fast to stay sweet. Garlic, bulb onions, and shallots naturally begin to dry this month. When the foliage begins to dry it’s time to stop watering. Dry outer layers needed for long storage will form on the bulbs. When about half of the foliage slumps to the ground, bend the rest to initiate this maturing. The bulbs will be ready for harvest when the foliage is thoroughly dry and crisp. Good quality organic MULCH feeds your soil, keeps your soil cooler, moister, less water needed and prevents light germinating seeds from starting – less weeds! Pat on Mycorrhiza fungi right on the roots of all your transplants except Brassicas, when you put them in the ground. It increases uptake of nutrients, water, and phosphorus that helps roots and flowers grow and develop. Ask for it bulk at Island Seed & Feed in Goleta. If you garden in a windy area, put up porous windbreaks to slow soil drying, and you will have less dusty conditions that bring White Flies. Use a water device with an easy to use shut off valve. It’s Mulch time! Compost is fine and fluffyish, intended to feed your plants, goes IN your soil. Mulch has larger pieces, and is meant to cover the surface to keep your soil cooler and moist. If it is put in the soil, larger pieces use your soil Nitrogen as they break down, depleting the Nitrogen your plants need. Straw is probably the cheapest and cleanest organic mulch. Some don’t like it that you do have to pull grasses that come up. Others don’t mind at all, they just tuck it under the mulch and it feeds the soil too! Otherwise, get good quality bags of undyed mulch. If you are an organic gardener, it’s up to you if you choose to use City mulches. They are made from street side green waste recycle containers that can include diseased plants, non organic chemical treatment residues, toxic plastics etc. Living mulch is when you plant an area densely enough that the leaves of the plants shade your soil and keep it moist. Lettuce does a good job. But also know that makes a moist habitat for slugs and snails, so put down some organic bait two or three times to kill off the generations. Get the store brand of Sluggo. It’s non toxic to pets and kids! Peppers are the last plants you mulch. They like soil temps above 65. Mulch keeps the soil cooler, so use your soil thermometer to see if the mulch is cooling it too much for your peppers. Any Brassicas – broccoli, kale – you are over summering need good deep mulch, 4 to 6 inches. They like cool soil. Please plant Bee Food, Herbs and Flowers! Sow or transplant basil, borage, chervil, chamomile, chives, cilantro, comfrey, dill, fennel, lavender, marjoram, mint, oregano, rosemary, sage, savory, tarragon, and thyme. Be mindful where you plant them… Mediterranean herbs from southern France, like lavender, marjoram, rosemary, sage, savory, and thyme, do well in hot summer sun and poor but well-drained soil with minimal fertilizer. On the other hand, basil, chives, coriander (cilantro), and parsley thrive in richer soil with more frequent watering. Wise planters put chives where you need to repel Bagrada Bugs, by your broccoli, kale, but away from peas if you are still growing some. Cilantro, a carrot family workhorse, discourages harmful insects such as aphids, potato beetles and spider mites, attracts beneficial insects when in bloom. Dill is a natural right next to the cucumbers since you will use the dill if you make pickles. They mature about the same time. Let some of your arugula, carrots, lettuces, cilantro bloom! Bees, and insect eating birds and beneficial insects love them and you will get some seeds – some for the birds, some for you, some to swap! Grow beauty – cosmos, marigolds, white sweet alyssum – all benefit your garden in their own way! The first gatherings of the garden in May of salads, radishes and herbs made me feel like a mother about her baby – how could anything so beautiful be mine. And this emotion of wonder filled me for each vegetable as it was gathered every year. There is nothing that is comparable to it, as satisfactory or as thrilling, as gathering the vegetables one has grown. See the complete April Green Bean Connection for more great veggie gardening tips! Since we had such a cool April in Santa Barbara area, see April for more of what we can plant now in May! Teas! Compost, Manure, Worm Castings Brews! Events! International Permaculture Day, Fairview Gardens – Farm to Table & Farm Camp, Permaculture Course at Quail Springs! June Magical Summer Garden Treats! Wonderful painting by Lynn Fogel inspired by the Santa Barbara CA Summer Solstice Parade! Love your Mother! Plant bird & bee food! Capture water! Grow organic! May brought tasty zucchinis, the first cherry tomatoes were eaten. Lettuces. Peppers appeared. Eggplants are blossoming. Potatoes and carrots were harvested and Beans on the bush and vine. A cucumber, many more babies coming! Huge Seascape strawberries! Put harvesting containers on stakes near what you will harvesting there. Convenient and saves time. Continue your harvesting, plant more! Definitely time for another round! Okra starts better now, eggplant is happy, and long beans started now like the heat of late summer when they produce those long grand beans as other beans finish! If a plant or two aren’t coming along well, replace them. A healthy plant will grow well and quickly in the warmer time coming. Extend your harvest later into summer by planting more of everything except winter squash, melons, pumpkins, unless you live in the hot foothills. Seeds are fine, transplants are faster. From transplants, more celery, corn, eggplant, leeks, limas, okras, peanuts, peppers, soybeans, squashes, sweet potatoes, and tomatoes. Choose bolt resistant, heat and drought tolerant varieties. Time for Sierra, Nevada, Jericho, Black Seeded Simpson lettuces. Plant another round of anytime fillers: beets, carrots, chicory, chives, slo-bolt cilantro, leeks, green onions, small summer radish, warm season spinach. Pat Mycorrhiza fungi right on the roots of all your transplants except Brassicas, when you put them in the ground. The fungi increase uptake of nutrients, water, and phosphorus that helps roots and flowers grow and develop. Ask for it bulk at Island Seed & Feed in Goleta. Remember these excellent companions! Combining them often gives two crops in the same place! Pop in some tasty white potatoes with Zucchini to repel squash bugs. Add some quick growing radish with zukes, and trellised together beans/cukes to repel cucumber beetles, the little guys with yellow/green stripes. Plant a flock of carrots intermingled with cilantro and chamomile! Just plain pretty. Basil is a natural with tomatoes, smells great and is super nutritious! Super nutritious Culinary dandelions are thought to repel white flies, mosquitoes, tomato hornworms, aphids, houseflies, and asparagus beetles. Flowering plants starting to produce need another feed, sidedressing. Give them a deep drink of tea or fish emulsion. Spade fork in some holes, pour your tea down them. if you don’t have skunks or other predators, give them a good fish emulsion/kelp liquid feed down those holes! Or pull back the mulch, scratch in a little chicken manure – especially with lettuces. Top with a 1/2″ of compost and some tasty worm castings! If you prefer organic granulated fertilizer sprinkle it around evenly. Recover with your mulch, straw, then water well and gently so things stay in place. That’s like giving them manure/compost/worm tea in place. If any of your plants are looking puny, have yellowing leaves, might give them a bit of blood meal for a quick pick me up. Summer WATERING is a skill! The key to good looking fruits is regular watering and enough water. After you water stick your finger in the soil and see if is wet below or just at the surface. A general rule is an inch a week. Summer plants often need more during hot weather. If plants don’t get enough water, production is sporadic, fruits misshapen, they are susceptible to pests and diseases. Too much water brings ‘soft’ plants susceptible to aphids and leafminers. Water early AM when possible to let plants dry off, avoid mildew. Water at ground level with a long wand with a shut off valve, rather than overhead watering unless you plant is dusty. Dust brings whiteflies. Keep seeds and emerging and young seedlings moist. Lay down some Sluggo type stuff, as soon as you have seeded, to jam up the slugs and snails before they have a chance to eat your prize babies. Irregular watering makes beans and cucumbers curl, strawberries to have irregular shapes. Chard needs plenty of water to make those big sweet leaves. However, chard naturally shuts down and droops in the heat of the day. Don’t mistakenly drown it! Water beans, cukes, lettuces and short rooted varieties of strawberries more frequently. They are all workhorses producing fast and repeatedly, cukes making a watery fruit even. Lettuces need to put on growth fast to stay sweet. Heavy producers like beans need plenty, especially if they are closely planted. Tomatoes have deep tap roots and can make do with little water. In fact, dry farming concentrates their taste! Big plants like corn and zucchini need ample water as do huge vines like winter squash, melons, pumpkins. Stake the centers of vine basins so you know where to water the roots. MULCH If you haven’t mulched yet, this is a good time to do it before we go into hot July, August, September. Replenish thin mulch. Use a soil feeding mulch, seedless straw works well. Use an inch or so under tomatoes. You want their soil to get a little air, the soil to dry some, and if you have it, the fungi to die. Otherwise you can put on, up to say, 6″ worth. The exception would be to leave soil under melons and other real heat lovers bare so the soil is good and HOT! Yes, they will need more water, so be sure your basin is in good condition and big enough so they get water out to their feeder roots. You can see the dripline of your plant by watering at the central area and seeing where the water falls off its leaves. Plus, mulch prevents light germinating seeds from starting – less weeds! Pest prevention! One of the fastest things you can do is plant radish, a couple here, a couple there. They repel those cute but very nasty disease carrying cucumber beetles, are a trap plant for flea beetles. Plant enough for eating, leave one to grow up and protect your plants. If you are by road or in a dusty windswept area, rinse off the leaves to make your plants less attractive to whiteflies. Also, remove yellowing leaves that attract whiteflies. Smart pests adore tasty healthy plants just like we do. They also make us see which plants are weak or on their way out. Give those plants more care or remove them. Replace them with a different kind of plant that will do well now. Don’t put the same kind of plant there unless you have changed the conditions – enhanced your soil, installed a favorable companion plant, protected from wind, terraced a slope so it holds moisture, opened the area to more sun. Be sure you are planting the right plant at the right time! If your soil has disease fungi, remove any leaves that can or will touch the ground. Remove infected leaves ASAP, don’t let the leaves of one plant touch another. This especially goes for tomatoes. Remove alternate plants that have grown to overcrowded conditions. The remaining plants will grow bigger, produce more with ample space. See April’s chat on Tomato and Cucumber specifics – A word on the Wilts. Lay down a loose 1″ deep straw mulch blanket. Too much straw keeps the soil moist, which is good for some plants, not for others. Under maters and cukes, we want some air circulation and a bit of soil drying. In their case, the main purpose of mulch is to keep your plant’s leaves from being water splashed or in contact with soil, the main way they get fungi/blight diseases. Keep your garden clean. Remove debris, weed. Remove mulch from under plants that were diseased and replace with clean mulch. HARVEST! Harvest at your veggie’s peak delicious moment! Juicy, crunchy, that certain squish in your mouth, sweet, full bodied flavor, radiant, vitamin and mineral rich! Besides being delicious and beautiful, it keeps your plant in production. Left on the plant, fruits start to dry and your plant stops production, goes into seeding mode. The fruit toughens or withers, maybe rots, sometimes brings insect pests that spread to other plants. Keep beans picked, no storing cucumbers on the vine. Give away or store what you can’t eat. Freezing is the simplest storage method. Cut veggies to the sizes you will use, put the quantity you will use in baggies, seal and freeze. Whole tomatoes, chopped peppers, beans, onions. Probiotic pickle your cukes. Enjoy your sumptuous meals! Sing a song of gratitude and glory! See the entire June GBC Newsletter! Tower or on the Ground Gardening?! Events! Home & Garden Expo, Summer Solstice Celebration! Fairview Farm – Summer Farm Camp! …and wonderful images of Pilgrim Terrace Community Garden in May! APRIL – First Heat Lovers Plantings! Night air temps steadily above 50 and soil temps 60 to 65 are what we are looking for. Peppers, especially need these warmer temps. They do best with nighttime temps above 55°F and soil temps above 65°F. Average March night air temps have recently bounced from the 40s to 50s. On a cool March 31st, the soil temp now is +/- 60°F at Pilgrim Terrace Community Garden. Get yourself a little soil thermometer, and plant just at the right times in the right places. It makes the most difference to peppers. If planted too soon, sometimes they miss their natural sequence of production, and never produce. Warm soil, 65°F+, and nighttime temps above 55°F is what they like! BEST PLANTING TEMPS PER VEGGIE! APRIL through June Planting Timing Start MORE seedlings indoors NOW for late May/early June plantings. Sow seeds. If seeds and tending seedlings aren’t for you, get transplants and pop them in the ground per their right times! APRIL is true heat lovers time! Eggplant, limas, melons (wait until MAY for cantaloupe), peppers, pumpkins and squash! Many wait until May, some even June, to plant tomatoes. Wait until the soil has warmed to 70°F before planting squash and melons. Some gardeners wait until JUNE to plant okra. It really likes heat and grows quickly when happy. Choose faster maturing varieties for coastal SoCal. If YOU anticipate a HOT summer, plant a tad earlier, but be prepared to deal with it if summer is overcast as often is the case after all. With our warming temp trends, get bolt resistant/slow bolt varieties, and especially drought tolerant varieties. Indoors, sow eggplant, peppers, and more tomatoes for transplanting into the garden in late May/early June. April 1 or as close to it as you can, start your Jicama seeds! Winter squash for sure. It needs time to grow big and harden for winter storage. Melons now but cantaloupe in May. Eggplant, limas, okra and peppers, pumpkins! Transplant early-maturing varieties of beans, cucumbers, eggplant, melons, peppers, squash, and tomatoes. Sow and/or transplant asparagus, beets, carrots, celery, chard, corn, herbs, kale, kohlrabi, leeks, heat-tolerant leaf lettuce, okra, summer-maturing onions, parsley, peanuts, the last peas (choose a heat-tolerant variety such as Wando), white potatoes, radishes (with cukes to repel cuke beetles, and eggplant to repel flea beetles), rhubarb, and spinach. Choose heat and drought tolerant varieties when you can. Tomatos! Heirlooms are particularly susceptible to the wilts, Fusarium and Verticillium. Instead, get varieties that have VFN or VF on the tag at the nursery. The V is for Verticillium, the F Fusarium wilt, N nematodes. Ace, Early Girl, Champion, Celebrity, are some that are wilt resistant/tolerant. In these drought conditions, consider getting only indeterminates. In the Mother Earth News tomato survey, they found gardeners chose heirlooms over hybrids if their soil is wilt/blight free. Otherwise, the longer the gardener has gardened, they more they chose wilt resistant toms if their soil has fungi. A word on the Wilts. They are both water and airborne. Regarding soil fungi like Fusarium and Verticillium wilts/fungi, how you care for cukes and toms is super important! Cucumbers are even more susceptible than tomatoes to the wilts fungi, die pretty instantly, in about 3 days, if they get infected. So when you plant them, treat them similarly to your tomatoes if you have wilts fungi in your garden. Plant cukes and toms on a raised mound/basin with the bottom of the basin above the regular soil level. This allows good drainage. Top that with a 1/2″ of compost, cover that with 1″ of straw to let in air and sun to dry the soil. Keep the LEAVES OFF THE GROUND from the get go. Leaves touching the soil is the main way toms get the wilts. Remove lower leaves that might touch soil when weighted with dew or water from watering. Keep a regular watch for new foliage at ground level and remove it. AVOID WATER SPLASH and watering at ground level. Fuzzy damp leaves of toms and eggplant are perfect fungi habitat. Since toms have a deep taproot, they will get water from what you give to neighboring plants. Water near them but not at them or on them. If you are comingling beans with cukes lower along a trellis, plant the beans between the raised mounds. Beans don’t get the wilts, but love the water. They are a big plant with continuous high production and small roots that need to be kept moist. Mulch with straw under cukes to keep leaves and fruit off the ground, and out of the insect zone. Since the fungi are airborne, plant in different places as far apart as possible. Plant so leaves of one plant are not touching another plant. Remove sickened foliage ASAP to reduce fungi population and slow spreading. The wilts can’t be stopped. Sooner or later the plant leaves curl lengthwise, get dark spots, turn brown then blacken and hang sadly. Plants can produce but it’s agonizing to watch. Sometimes they somewhat recover later in the season after looking totally dead. You stop watering them, summer heat drys the soil and kills enough of the fungi for the plant to be able to try again. But production is so little, it’s better to pull it, reduce the fungi population that can blow to other plants. Replant, in a different place if possible. Strengthen your garden! Remember your Companions! Carrots love being with cilantro and chamomile! Keep ’em coming! If you have already done some planting, mid to late April, pop in another round! Poke in some bean seeds where your last peas are finishing, add cucumber seeds between the beans, plus dill at each end of the trellis to be there when you pickle your cukes! Plant radishes with the cukes to deter the Cucumber beetles. Plant corn in blocks, not rows, for good pollination! In a good hot area, lay in some cukes, melons or last minute winter squash, to ramble among the corn, soon as they are tall enough. They all act as a living mulch, reducing water needs. This year my summer strategy is to plant tall in the West to filter sunlight, give shorter plants respite from the hot afternoon sun, keep them a bit cooler, keep the soil a bit cooler, more moist. Last summer, record HOT, our crops produced so much, they were plum done in July. Fall planting wasn’t successful until the end of October. Hopefully my new strategy will give a longer growing period this year. Plant companion plants that repel pests, enhance each other’s growth so they are strong and pest and disease resistant. Mix it up! Less planting in rows. Split up groups so pests won’t go from one plant to the next, and the next. Think biodiversity! Maintenance! Keep your plants strong while they are working hard! Be ready to do a little cultivating composts and manures in during the season (called sidedressing), or adding fish/kelp emulsion mixes if you don’t have predator pests like skunks! Keep your plants watered and vibrant, but not so much as to make their leaves soft and inviting to munching insect pests. Trap gophers immediately if you are able. Prevention A frustrating typical spring disease is Powdery mildew. It’s common on late peas, Curly Leaf kales, broccoli. Plant leaving plenty of space for air circulation. Apply your baking soda mix. Drench under and upper sides of the foliage of young plants to get them off to a great start! Do this the same or next day if transplanting. A super combo is 1 regular Aspirin dissolved, a 1/4 cup nonfat powdered milk, heaping tablespoon of baking soda, a teaspoon liquid dish soap per gallon/watering can. Reapply every 10 days or so, and after significant rains. Not only is prevention so much better than after mildew has set in, but this mix stimulates your plant’s growth! See Aspirin Solution. Make mounds with basins on top. Rather than losing water to evaporation from overhead watering, put the water right where it will do the most good and nowhere else. For larger leaved plants, put a stake in the center of the basin so you know where to water. With a long watering wand you can water under the leaves rather than on them ~ unless they need a bath. Dust Mulching, cultivation, is perfect to break up the soil surface. That keeps the water from wicking to the surface and evaporating. If you use a hula hoe you do two things at once! Just a half to one inch depth cuts off weed sprouts that use water. Indeed, it turns the soil a tad, all that’s needed. More weeds will follow, but it’s quick and easy to repeat the process. Two, three times, a few days apart, and there will be little weeds after that for awhile. Get ’em while they are small and easy to do. Smart gardening. Plant Bee Food, Herbs and Flowers! Sow or transplant basil, borage, chervil, chamomile, chives, cilantro, comfrey, dill, fennel, lavender, marjoram, mint, oregano, rosemary, sage, savory, tarragon, and thyme. Be mindful where you plant them… Mediterranean herbs from southern France, like lavender, marjoram, rosemary, sage, savory, and thyme, do well in hot summer sun and poor but well-drained soil with minimal fertilizer. On the other hand, basil, chives, coriander (cilantro), and parsley thrive in richer soil with more frequent watering. Wise planting puts chives where you need to repel Bagrada Bugs, by your broccoli, kale, but away from peas if you are still growing some. Cilantro, a carrot family workhorse, discourages harmful insects such as aphids, potato beetles and spider mites, attracts beneficial insects when in bloom. Dill is a natural right next to the cucumbers since you will use the dill if you make pickles. They mature about the same time. Let some of your arugula, carrots, lettuces, cilantro bloom! Bees, and insect eating birds and beneficial insects love them and you will get some seeds – some for the birds, some for you, some to swap! Grow beauty – cosmos, marigolds, white sweet alyssum – all benefit your garden in their own way! See the complete April Green Bean Connection for more great veggie gardening tips! Southern Exposure Very Hot Summer Plants! Costata Romanesco Italian Heirloom Zucchini! Growing the Perfect Veggies for Seniors! Botanic Garden SALE, EARTH DAY, Fairview Farm – Farm to Table Dinner, Farm Camp! Welcome to the Beauty of October Planting! Happy October, Month of Magic! The next months…so you can plan ahead! November Seeds of onions for slicing. Wildflowers from seed (don’t let the bed dry out). Strawberries in no later than Nov 5. More transplants of winter veggies. My campaign this fall is for garden cleanup, and turning the soil to expose the fungi that affects our tomatoes, and other plants, so the fungi dries and dies! Purple Broccoli, Bright Lights Chard, Cauliflower, Yellow Mangetout Snow Peas, Radishes or Beets of all colors, ‘Licous Red Lettuces! This is Southern California’s second Spring! Time to plant your winter garden, all the Brassicas, that’s, cabbage, brocs, Brussels sprouts, cauliflower, collards, kales, plus celery, chard and peas, peas, peas! All kinds! And what I call the ‘littles,’ the veggies you plant all year, beets, bunch onions (the ones that don’t bulb), carrots (bonemeal yes, fresh manure no), radish, spinach, arugula, and, especially, all kinds of lettuces! Plant gift plants or bowls or baskets for the holidays! Start making holiday gifts, herbal wreaths, powdered herbs, pretty vinegars and oils, shampoos, soaps, or candles! Winter weather? Bring it on! Starting to cool down now! Your plants will grow fast then start to slow down. Less weeds and insects. Aphids & White Flies are a winter crop problem (see below please). Some people prefer the cool slower pace of winter gardening to the more phrenetic hot summer labor and work of big harvests, distribution, storage. Harvesting cold hardy vegetables after they have been hit with a touch of frost can enhance the flavor and increase the sweetness of greens such as kale and collards. Extend the crop! Cut and come again! Harvest your big greens – kale and collards, and lettuces leaf by leaf rather than cutting your plant down. Many lettuces will ‘come back’ even if you cut them off an inch or two above ground. Leave the stalk in the ground, see what happens! Rather than pulling your bunch/table onions, cut them off about an inch to 2 inches above the ground. They will come back 3 to 4 times. Leave a potato in the ground to make more potatoes. After you cut the main broccoli head off, let the side sprouts grow and snip them for your salads or steam them. Cabbages? Cut off right below the head, then let them resprout, forming several smaller heads at the leaf axils. Gather your last lingering seeds midday on a sunny dry day. Dry a few seeds from your favorite tomatoes! Sidedress continuing and producing plants. Then cleanup! Remove funky habitat for overwintering insect pests, fungi. Build wire bottomed raised beds for gopher protection. For very useful information, please see University of California, Integrated Pest Management (IPM) Pocket Gophers. If you are a new gardener at Pilgrim Terrace, ask other gardeners, or the previous person who had your plot, how the soil was tended. Some plots may need no amending, others may need a lot. Add compost, manures, seaweeds, worm castings as needed. Some people do the whole garden at once, others conserve valuable materials by preparing only where they will specifically plant, for example, a large plant like a broc. If it is a lettuce bed that you will do repeated plantings in, you might opt to do the whole bed at once. Since mulch keeps the soil cool, some people pull it to the side in winter, to let the sun heat the soil on cool days. Simple soil test! Test the soil by putting a drop of vinegar in a teaspoon or so. If it fizzes, it’s too alkaline. Then test it by putting in baking soda mixed with a little water. If it fizzes, it’s too acidic. In addition to planting your veggies, plan ahead to plant flowers, to always have some in bloom, to attract pollinators. Borage is a lovely plant, blooms all year, has purple blue star flowers that are edible and good for you! Toss a few on top of your salads! Make habitat! Plants for beneficial insects, poles for birds, rocks for lizards! Plant tall in the North, the mountain end of our plots; plant shorties in the South. This is especially important in our winter gardens because of the low sun long shadows. Give your big plants plenty of room to become big; plant fillers and littles (beets, bunch onions – the ones that don’t bulb, carrots, radish, spinach, arugula, lettuces) on their sunny south sides! Put plants that like the same amount of water together (hydrozoning). Put plants together that will be used in the same way, for example, salad plants like lettuces, bunch onions, celery, cilantro. Biodiversity. Planting the same kind of plant in different places throughout your garden. It can be more effective that row cropping or putting all of one plant in one place, where if disease or a pest comes, you lose them all as the disease or pest spreads from one to all. Layering example: Transplant peas at the base of any beans you still have. This is the time to put your mycorrhiza fungi to work! One of the great things mycorrhiza does is assist Phosphorus uptake. Of the N-P-K on fertilizers, P is Phosphorus that helps roots and flowers grow and develop. Sprinkle it on the roots of your transplants when you plant them! More about mycorrhiza: http://www.mycorrhizae.com/index.php?cid=468& http://www.mastergardeners.org/newsletter/myco.html Island Seed & Feed carries it. Use vigorous fresh seeds, choose vibrant not-fruiting transplants that preferably aren’t root bound (having a solid mass of roots). If the transplant is pretty big for the container, pop it out of the container to make sure it isn’t root bound. If it is the only one there, and you still want it, can’t wait, see what John R. King, Jr (2 min video) has to say on how to rehabilitate your plant! Lay down some Sluggo (See Slugs & Snails below) right away, even before seedlings sprout, when you put your transplants in, so your plant isn’t overnight snail and slug smorgasbord! Strawberry Runners! Mid Oct cut off runners, gently dig up if they have rooted, shake the soil off. Clip all but two or three leaves off, tie ‘em together in loose bunches. Plastic bag them and put in the back of your fridge for 20 days. Plant them Nov 5 to 10! Prechilling your plants makes them think they had a cold winter. When days get longer and warmer, they will produce fruit, not as much vegetative growth. You can then either keep your plants that produced this year, or remove and compost them, start fresh with new plants! Watering – Morning when you can because plants drink during the day, and we want them to dry so they don’t mildew! Water underneath, especially late beans, and your new peas, who are especially susceptible to mildew. Except for your short and shallow rooted plants, once a week and deeply is good unless there is a hot spell or rain. Then, check ’em. Poke a stick in the ground to see if the soil is moist under the surface. Happy playing in the dirt! 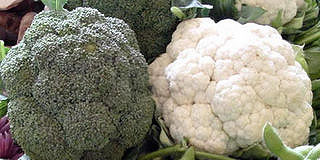 –> Is cauliflower like broccoli in that after you cut off the head, smaller sprouts will appear? Nope. –> So once I harvest the cauliflower, should I cut it all down and let it compost into the soil or plant something else there? NO! Brassicas, includes cauliflower, brocs, kale, Brussels sprouts and collards, are not so good in the soil. Look at the bottom two paragraphs on broccoli at this link. Always remove their fallen leaves, and the plant when you are done with it. While it is still growing, you can grow another crop underneath by removing the lower leaves to allow light for the new plants to start. All Brassica leaves can be eaten like collard leaves – steamed, or tossed in a wok with oil, sprinkled with soy sauce or a sauce of your choice. If it is a plant you will remove, like cauliflower after it has headed, or you don’t need as many brocs and need room for summer plants, leave enough room so when you remove the Brassica, pulling its roots out doesn’t overly disturb the newly growing plants underneath. Brassicas are heavy feeders, so after you remove it, depending on what you have planted to take its place, you might incorporate a little manure and compost to beef up the soil again. Then if you like, you are ready to plant a new center plant, maybe a tomato, or a pepper! –> My cauliflower had a nice tight head (small) and then seems to have sprouted. I’m not sure if it’s “flowering” or what. Can you take a look and tell me if I should let it grow or what to do. I’ve never grown one before, and I’m simply not sure what to do. I’m guessing yours is the center one in the image above. Here is some more info about it. –> I’ve pulled out my cauliflower plants. Can I put peppers there now? Tomatoes? Yes, put in some manure/compost first because caulies and peppers/toms are all heavy feeders. Put a handful of bone meal in the tomato planting hole, and worm castings if you have them, mix it up! Sprinkle mycorrhizal fungi on the roots as you set your plant in. Put small babies, lettuces, culinary dandelions, onions, garlic, basil, strawberries, around them, particularly on the side that gets the most sun. As the bigger plants grow up, remove a few of the lower leaves so everybody gets plenty of light. Basil is a companion for toms. Peppers grow perversely slowly, bless them, so let them get a little height before you put fast growers underneath. Lettuces thrive on manure and lots of water. Happy Weekend Gardening & Harvesting!